A refugee crisis in 1851 brought a new religious minority to Toronto. 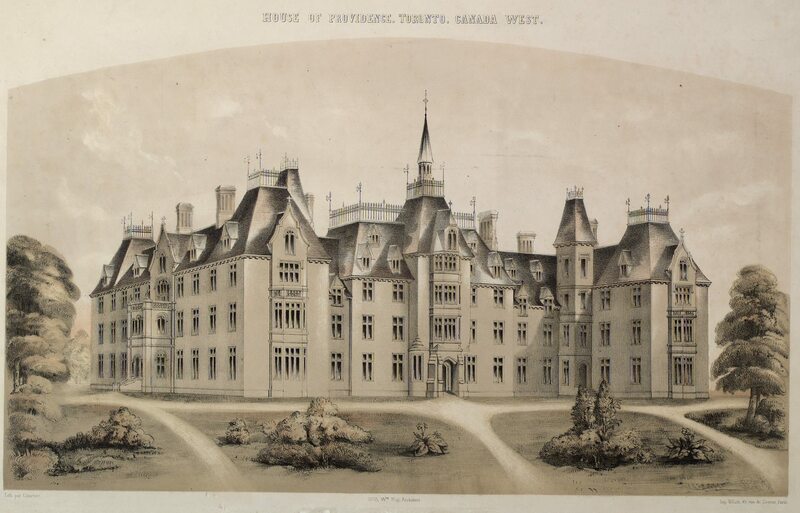 The House of Providence in 1855. 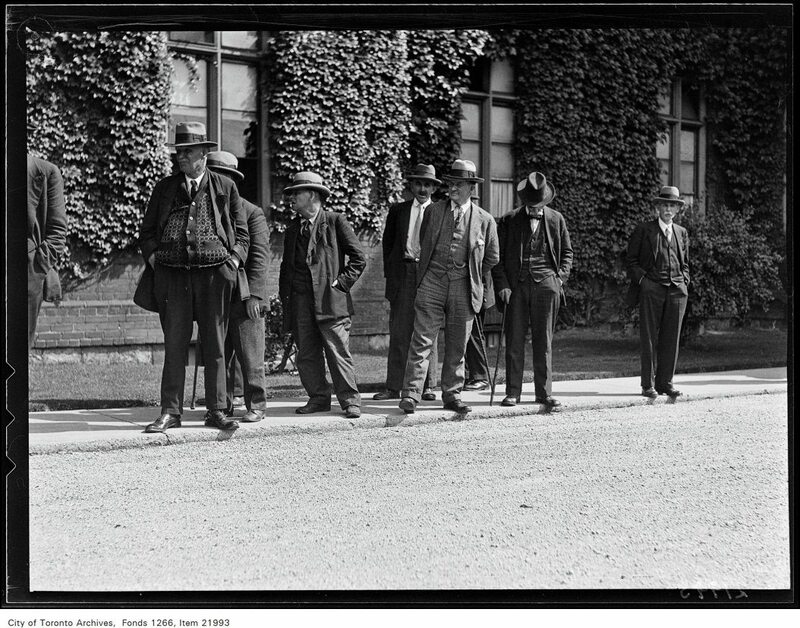 Picture from the Baldwin Collection at the Toronto Public Library, call number JRR 308 Cab III. Toronto in the 1850s was a city that had suddenly grown from an influx of refugees from the Great Famine (an Gorta Mór, the great hunger) in Ireland. A city of 20,000 in 1847 saw the arrival of over 38,000 Irish immigrants escaping the famine. By 1851, Toronto’s population had settled somewhat, at 30,775 inhabitants. The recent arrivals had fled poverty and starvation in Ireland, but many had died on the ships taking them to North America or in typhus sheds set up near the harbour. The bishop of Toronto, Armand-François-Marie de Charbonnel, along with the Sisters of St. Joseph, worked to open the House of Providence, to serve the poor of the city, no matter their religion. The idea behind the House of Providence was to provide a safe bed and a meal for the poor of the city. It was almost always full and grew nearly four times its original size to house 700 people, including the elderly, the sick, orphans, and recent immigrants. The building, designed by the architect William Hay, was on Power Street, at what is now the Don Valley Parkway exit to Adelaide and Richmond. According to a historical pamphlet about the House of Providence, written by Mabel Pillar for the Sisters of St. Joseph, the early years were a struggle, and the sisters went door to door to collect money and washing, which they were paid to do. She also tells a story of a time the sisters were low on money and couldn’t afford flour. So the Sisters of St. Joseph prayed and they prayed. Meanwhile, a farmer was returning from a mill where he had brought his wheat to be ground into flour. When his team of horses approached the gate of the House of Providence, they slowed down and refused to pass the gate. The good farmer then let them turn in. Needless to add, the farmer was welcomed with a refreshing cup of tea… and the Sisters got their flour! Men at the House of Providence during a picnic, September 18, 1930. Photo from the City of Toronto Archives, Globe and Mail fonds, fonds 1266, item 21993. Bishop de Charbonnel was concerned by the poverty he saw in Toronto, but also but what he felt was the under-education of his Catholic flock. During his tenure as bishop, he brought many religious orders, including the Sisters of St. Joseph, to Toronto to minister, teach, and serve the needy. He opened organizations, including the Toronto chapter of the St. Vincent de Paul society. He also established St. Michael’s School, and clashed with superintendent for education, Egerton Ryerson, over how Catholic schools should be funded and operated. He also oversaw the building of 23 new churches. When he arrived, the city of Toronto had only one church, at Queen and Power. St. Michael’s Cathedral was unfinished and in debt, but de Charbonnel established the Cathedral Loan Fund to finance its construction. He also managed to attract new priests to the area to staff the new churches and tend to the growing Catholic population, many of them Irish immigrants or their descendants. 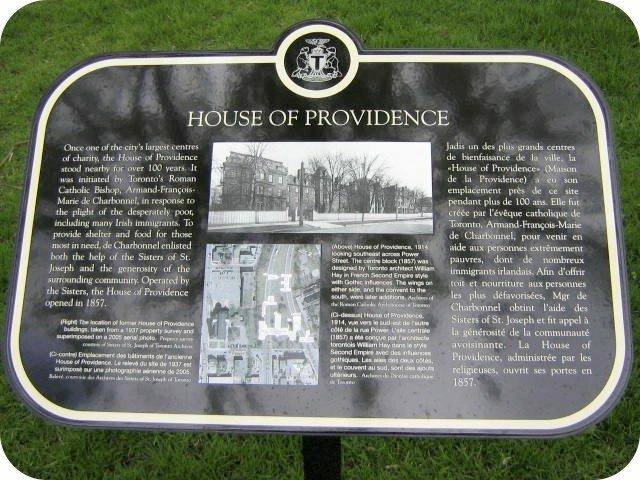 The first plaque for the House of Providence at Queen and Power. Photo by Alan L. Brown of torontoplaques.com. In 1962, the House of Providence moved to a former farm owned by the sisters and became a care home for the elderly and invalid. The Sisters of St. Joseph were the sponsors of what is now Providence Healthcare until 1998. The second House of Providence plaque. Photo by Alan L. Brown of torontoplaques.com. 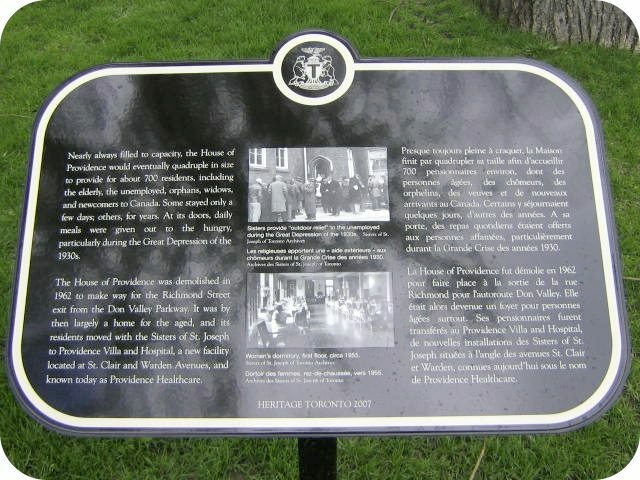 Two Heritage Toronto plaques telling the story of the House of Providence now stand at Queen and Power, near the original site and close to where the single Catholic church in Toronto once stood. 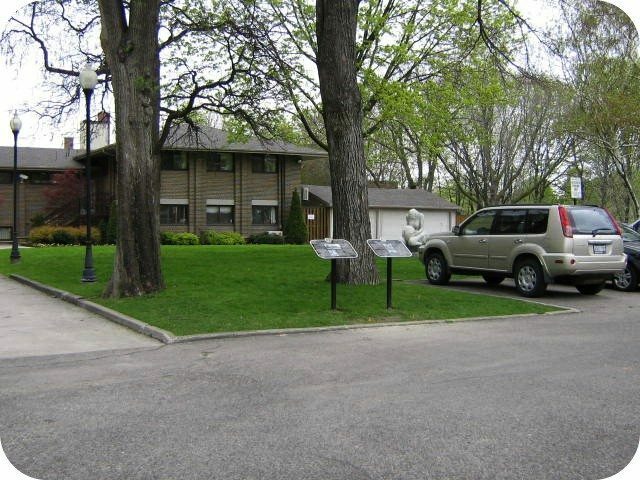 The site of the House of Providence plaques. Photo by Alan L. Brown of torontoplaques.com.